Chairman, L. F. WATTS Chief of U. S. Forest Service, Washington, D. C., U. S. A. A. FJELSTAD, Delegate of the Royal Norwegian Government on Agricultural Affairs, Washington, D. C., U. S. A.
H. MARK, Director of the Institute of High Polymer Chemistry and of the Chemical Department, Brooklyn Polytechnic Institute, New York, U. S. A. Chemical Wood Technology: Chairman, H. MARK Director of the Institute of High Polymer Chemistry and of the Chemical Department, Brooklyn Polytechnic Institute, New York, U. S. A.
Unexploited Forests: Chairman, T. GILL, Secretary of the Charles Lathrop Pack Forestry Foundation, Washington, D. C., U. S. A. Forest Research: Chairman, E. I. KOTOK, Assistant Chief in charge of Research, U. S. Forest Service, Washington, D C., U. S. A.
UNASYLVA is prepared by the Division of Forestry and Forest Products and published by the Information Division of FAO at the Organization's temporary headquarters in Washington, D. C. It is printed in Baltimore Maryland, U. S. A. UNASYLVA is published in English, French, and Spanish. 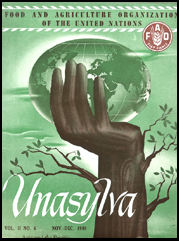 UNASYLVA may be obtained from the following sales agents: Australia: H. A. Goddard Pty. Ltd., Sydney, Canada: The Ryerson Press, Toronto 2; Czechoslovakia: F. Topic, Prague 1; Denmark: Ejnar Munksgaard, Copenhagen; Finland: Akateeminen Kirjakauppa Helsinki; France: Les Editions A. Pedone, Paris 5e; Latin America: International Documents Service, Columbia University Press, New York 27; Netherlands: N. V. Martinus Nijhoff, The Hague; Switzerland: Librarie Payot, S.A., Lausanne, and Hans Raunhardt, Zurich 1; United Kingdom: H. M. Stationery Office, London W.1; United States: International Documents Service, Columbia University Press, New York 27, and United Nations Bookstores, Lake Success, New York. Requests from countries where sales agents have not yet been appointed may be sent to FAO Documents Sales Service, Food and Agriculture Organization of the United Nations, Washington 6, D. C., U. S. A., Annual subscription, $3.50; single copy, 65 cents.